And it really was a welcome sight on a cold and rainy evening as me and Mr P drove up to the warm glow of the pub, which is set on the main road in Chapel Row just outside Bucklebury (The Duchess of Cambridge’s family home *insert curtsey here*). 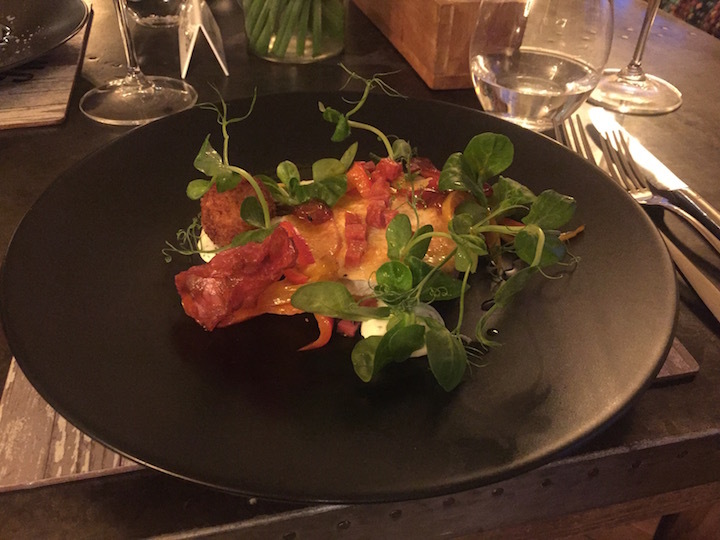 The food is presented with more of a flourish than your average pub meal and I soon find out why – Richie also runs an events company, RS Catering & Events so is well practised in stylish catering for the masses – and his food is excellent. We had a pre-starter to our starter, because that’s how Muddy rolls (and after this meal I literally did roll home). Warm cheese scones with a stonking great quenelle of salty butter – they were absolutely flipping delicious. We then moved onto the actual starters. 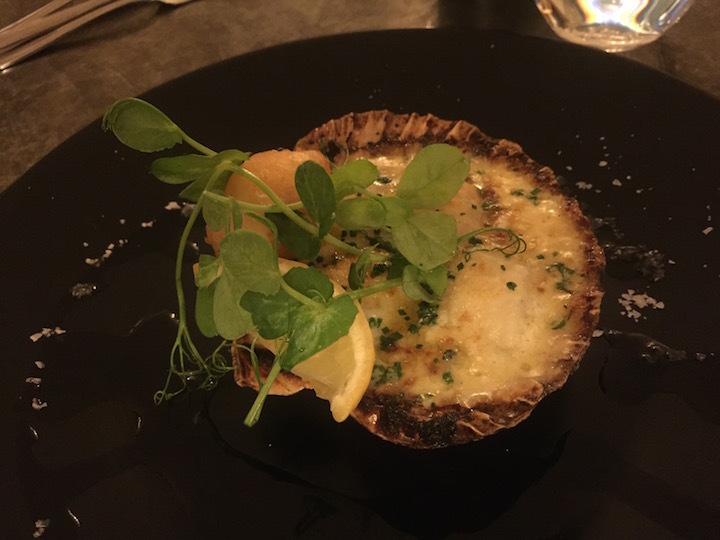 Mr P went for the scallops gruyère – a trio of plump, perfectly cooked scallops in a creamy Chablis sauce, whacked under the grill with brioche crumb and gruyère cheese. He said they were delicious, but did keep eyeing up my starter so I think he had slight food envy. And I did go one better, well three better actually, with my goats’ cheese ‘3 times’ – crostini, whipped mousse and a crispy bonbon with chorizo and smoky spiced tomato chutney. All the elements were beautifully cooked, but it was very cheesy (you don’t say!) and just a bit too much for me if I’m honest so Mr P helped me out. 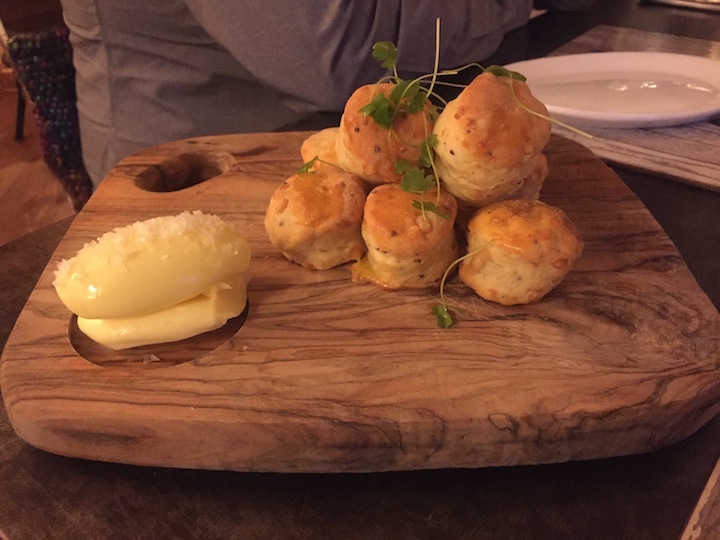 But really if you’re going to order a starter with three cheeses, having just scoffed your way through a pile of cheese scones, you’re asking for trouble aren’t you? I’ll plan a little better next time, rather than pushing on through like a chuffing cheese monster. 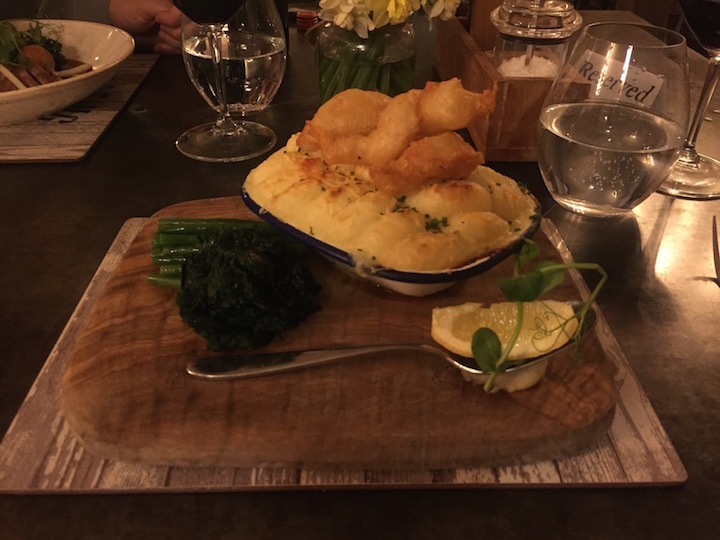 For my main I had The ‘Fish Pie’ (that’s how it was written on the menu; I hoped it was going to live up to those inverted commas). And it did. 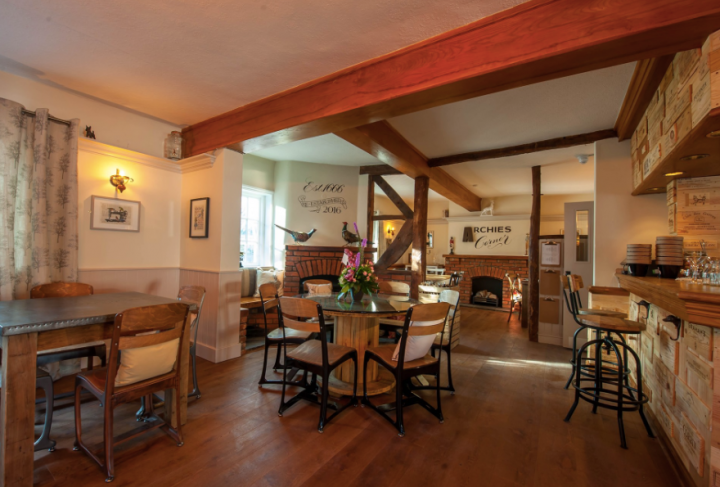 Listen up… Cornish cod, Scotch salmon and plaice in a creamy Chablis sauce. Topped with cheesy mash, crispy scallops and tiger prawns, with green beans and poached spinach on the side. It was absolutely hands down the best fish pie I have ever eaten (sorry mum). I don’t care if you’re on the other side of the county, I urge you to make the trip just for the fish pie. Now. Seriously, grab your keys and get in the car. 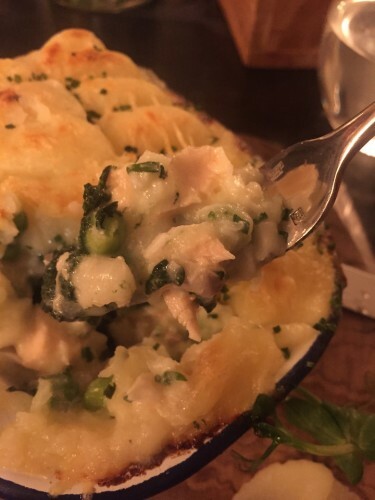 Best fish pie ever. EVER. 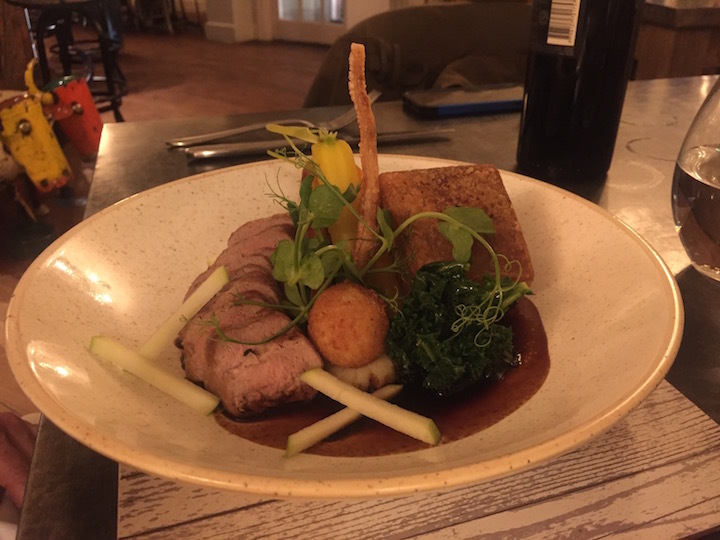 While I sat gazing lovingly at my fish pie and looking rather smugly at other diners who hadn’t ordered it, Mr P was tucking into his slow roast belly and fillet of orchard pig, kale, potato dauphin with sticky jus and diced apple. And I must admit, it did look amazing. He was silent throughout and hardly even took a sip of wine, so it must have been good. Pudding (wheel me home) was Baileys creme brûlée with homemade honeycomb, vanilla ice cream and a chocolate spoon for me. 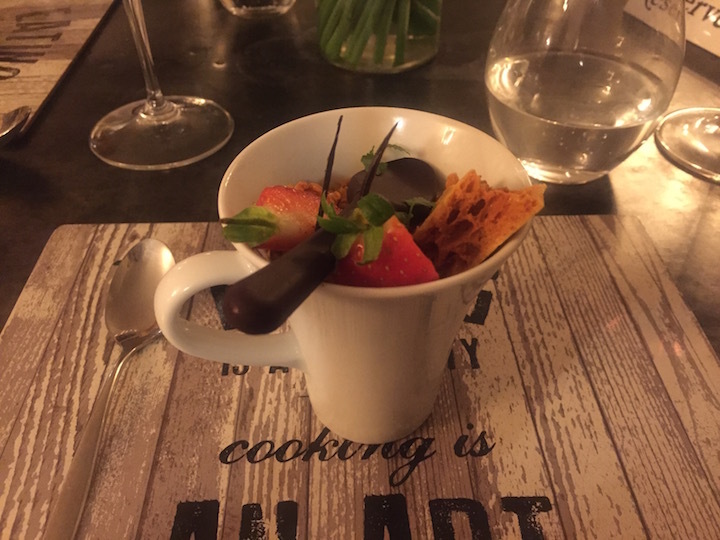 Let me say that again – a chocolate spoon, oh yes. Totally impractical (chocolate teapot comes to mind) but delicious dark bitter chocolate and a bit of fun. Note it is served with a more useable tea spoon. Or you can just stick your whole face in the mug à la Muddy. So classy. 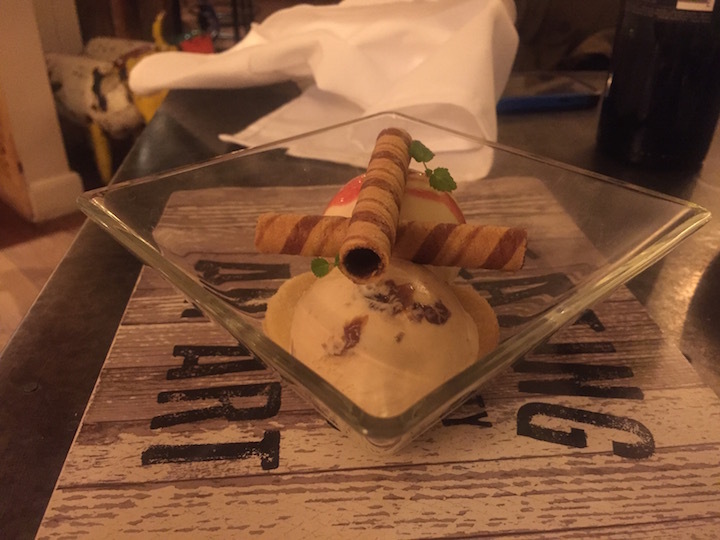 Mr P went for two scoops of locally made ice cream – rum and raisin and salted honeycomb. I had a spoonful of both and they were seriously delicious – that kind of rich, creamy ice cream that only exists in a proper Italian gelateria. Well, I can safely say you can save that ticket to Naples, you now only have to go as far as Bucklebury to find it. 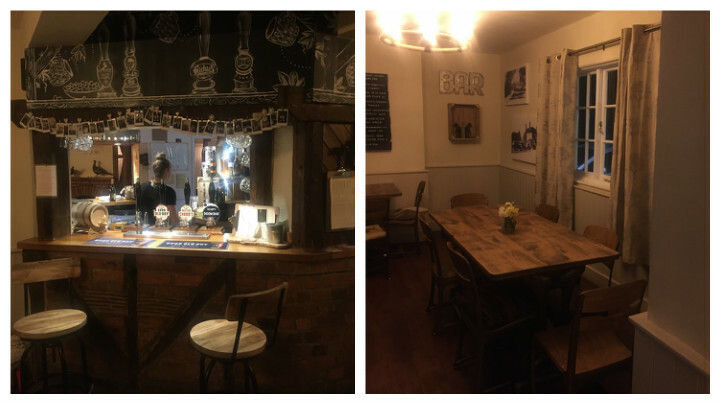 On the booze front, the pub is well stocked with local West Berkshire Brewery beers and its newest lager, Renegade. 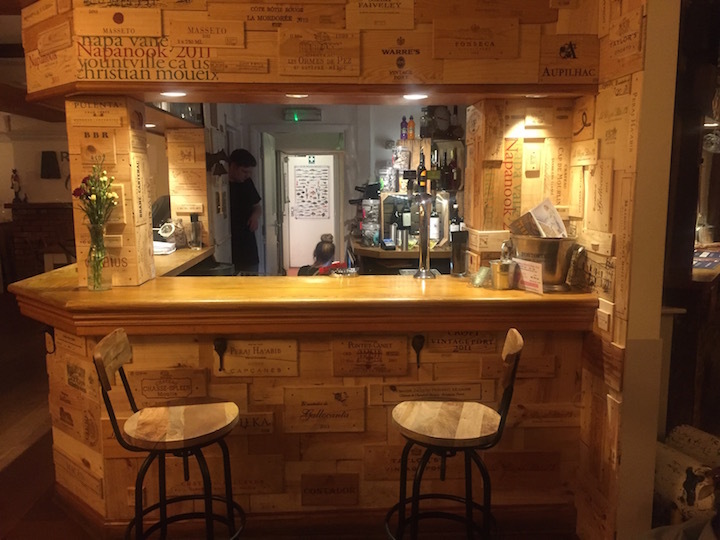 The wine list is nice and solid, not too daunting but with plenty of choice if you know your stuff and want to move away from your usual safe choice. We had a brilliant bottle of Malbec – Clasico Punto Final 2014 – deep black cherry fruit with a lifted spiciness and intense finish of dark chocolate flavours and a hint of vanilla. Whaddya mean I’m reading it off the bottle?! Uh, yeah, I am. Anyway, it was stonkingly good, £27. Plenty of wine by the glass too if you have more willpower than me, ranging from £6 to £9 for a 250ml glass. We were served by a young and friendly team who overall did a great job. 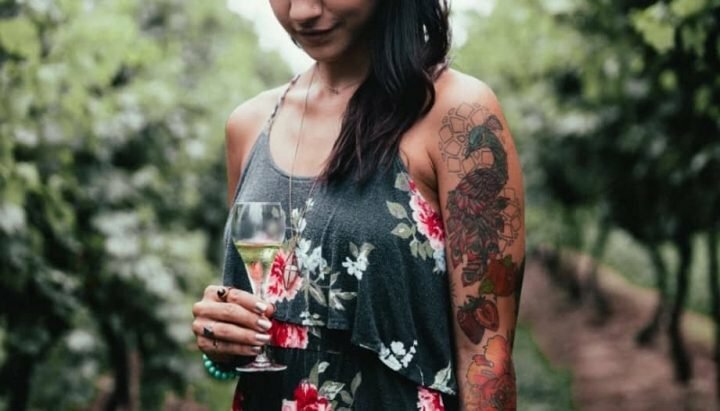 It was a little patchy in parts – our wine was just put on the table without being opened or poured for us – but these are just small bumps that I’m sure will be ironed out, and I couldn’t fault their warmth or enthusiasm. If you’re planning on bringing children, I’d say it’s the perfect place for them. The garden had a grand opening just a few weeks ago, it’s been nicely landscaped and opens out from the pub’s conservatory. 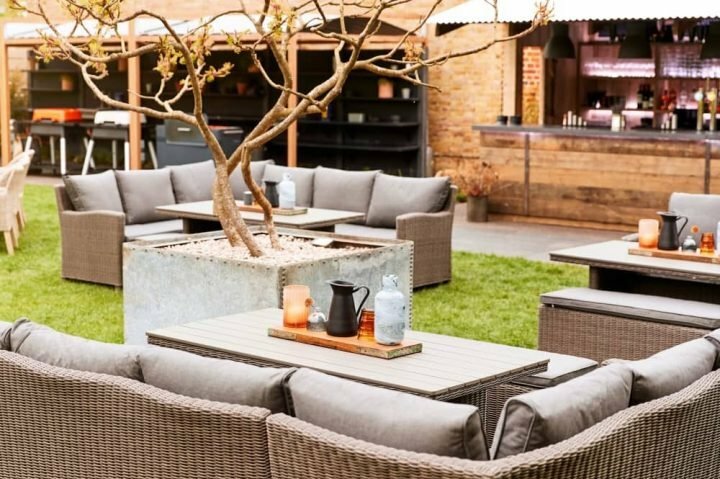 Now that we’re beginning to see a bit of Spring sunshine, I’d say a mid-week lunch or Sunday roast with the kids would be ideal. So get yourself down here, and tell me what you think of that fish pie! Good for: foodies who won’t mind making the effort to get here as it’s a little out in the sticks; walkers – you’re surrounded by beautiful countryside and there are some gorgeous circular walks; couples looking for somewhere unpretentious and cosy for date night; families or larger parties who want to spread out a little as it’s nice and spacious. Dog owners – dogs are welcome and there are dog treats at the bar. Kids – I’d be very happy bring the mudlets here as it’s so relaxed and Bucklebury Farm Park is just down the road so you could combine the two. 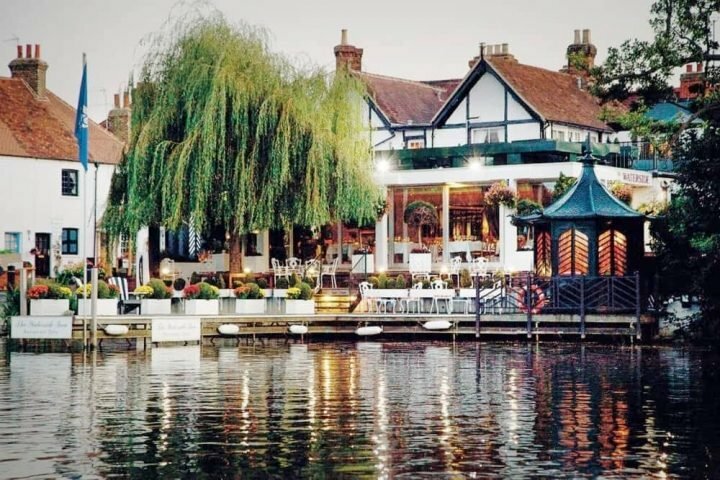 Not for: gastropubbers – this is more country cosy than slick and shiny, although the food is definitely gastropub standard rather than pub classics so it can feel a little out of kilter. It remains to be seen whether locals just looking for a pint and a bar snack will remain loyal, but I hope they do because Richie and his family are throwing themselves into the community supporting lots of local events, including the Bucklebury Artisan Food Market, well worth a visit. 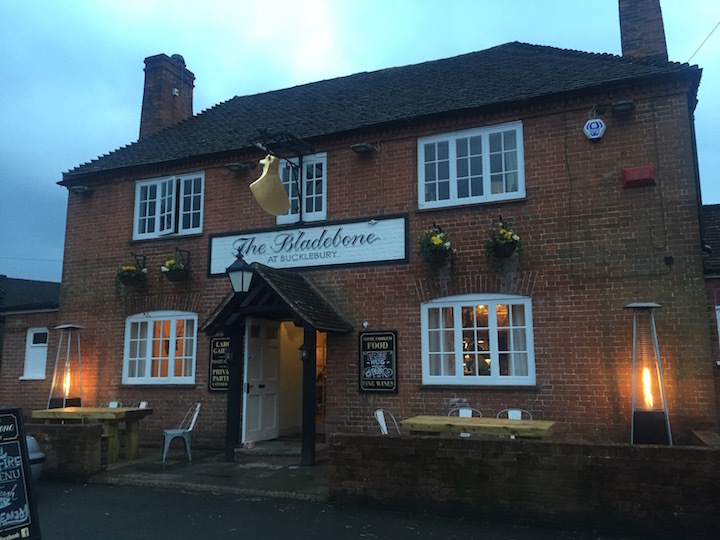 £££: Just edging to the expensive side of average for a pub, but I think we can blame that on the Middleton Factor, and the food is blinking good. Starters £5.50 to £9.50; Mains £13.50 to £30 (Lunch £7 to £15); Desserts £7 to £9.50. 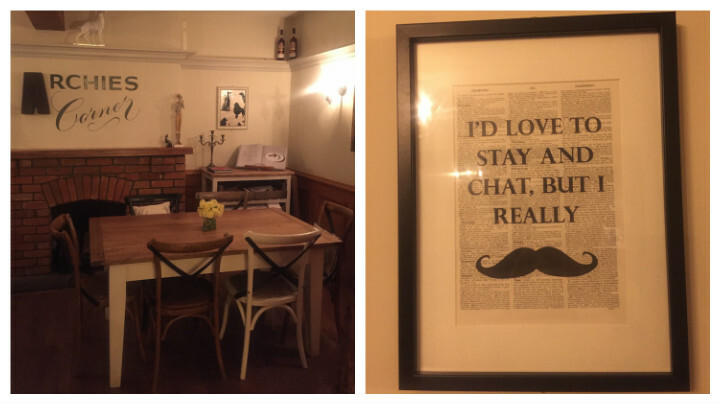 Opening hours: Mon-Sat 12 noon to 11.30pm; Sun 12 noon to 10.30pm.